Just over a year ago, I wrote a post entitled, "How to Make a Frittata Like My 99 -Year-Old Italian Grandmother." Today I'm writing a post entitled, "How to Make a Frittata Like My 100 -Year-Old Italian Grandmother." That's right. Last fall, Nan turned 100. My mom threw her an old-fashioned birthday party replete with party hats, balloons, and the most lovely rose covered pink and white cake you can imagine. As I have written here before, Nan was a wonderful cook; her food, a familiar host of Italian dishes, was always simple yet unforgettably delicious. Though I think of Nan throughout the year, I think of her even more frequently during the Lenten season (when many Catholics abstain from eating meat on Fridays). That's because she would always have freshly cooked frittatas waiting for my mom and me when we would visit her on Friday afternoons. Frittatas are incredibly easy and fast to make. Frittatas are inexpensive and make great leftovers, especially in sandwiches. Frittatas are endlessly versatile. Search your fridge, and toss in whatever vegetables, meats, and cheeses you like. Frittatas are fun to say. Seriously. Come on. Just say it once, like Nan used to: Fri - taaaa-taa. See what I mean? It makes me smile every time. 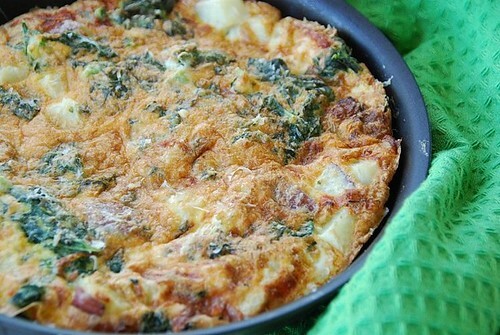 Today's frittata is make with earthy Swiss chard, creamy red potatoes, and salty Parmesan cheese. It pairs well with a cup of soup or a salad for dinner and makes a great breakfast sandwich when heated up and tucked inside of a toasted English muffin. Now here's hoping that next year I write a post entitled, ""How to Make a Frittata Like My 101-Year-Old Italian Grandmother." Par boil the potatoes by cooking them in a small pot of boiling water for 3 minutes. Drain and set aside. Par boil the Swiss chard for 2 minutes. Drain and set aside. Over medium-low heat, add olive oil to an 8-inch non-stick skillet. Add shallots and potatoes; saute until golden brown, about 5 min. Add Swiss chard and cook for 1-2 minutes. Meanwhile, whisk the eggs in a small bowl; add fresh basil, parsley, red pepper flakes, salt, mozzarella, and half the parmesan cheese and gently whisk until well combined. Pour the egg mixture into the skillet. With a fork, gently move the egg mixture from side to side as it begins to cook to ensure that it cooks evenly. Do this until the eggs start to solidify and a crust begins to form around the edges. This takes about 5-8 minutes. Give the pan handle a jiggle, and when the eggs appear nearly set, remove the pan from the stove top. Sprinkle the top of the frittata with remaining half of parmesan cheese and place under the broiler. Broil for 4-5 minutes, or until the top begins to puff up and turn golden brown. Keep a close eye on it so it doesn’t burn. Once nicely browned, let cool for a couple of minutes before slicing. Serve hot or at room temperature. Click here for more tips on how to make a frittata like my 100-year-old Italian grandmother. Amen! To writing next year's post about your 101 year old grandmother. What a blessing to have her and her wonderful culinary inspirations. Wow, 100 years old. I hope I live to see that day as well. A frittata is definitely an easy thing to throw together, and because you HAVE to brown it, it's forgiving...not like an omelette. Wow 100 year old naan. I have neve rmade frittate, these looks so yumm and it has to be delicious as this is the way they made . This looks so delicious! I just made my first fritatta a couple weeks ago and now find myself craving it! I love the stories about your grandmother; my grandmother lived to be 93 and my memories of her are priceless! Sounds delicious. I recently made a fritatta for the first time. It was so easy and a great way to use up both leftovers and the 10-12 eggs per day that my chickens are now laying! (Scratching my head)... see Swiss Chard in the title, but not in the recipe. It looks and sounds great without it anyway. Since we have laying hens too, we have plenty of eggs and need things to do with them. I've never made one of these; guess I'd better get with the program! What a blessing to still have your Nan with you! Frittatas were my father's specialty. He was always in charge of making one for Good Friday dinner. You post is timed perfectly. I was just thinking this morning about making a frittata for dinner. I was going to use asparagus, but you've sold me on Swiss chard. great recipe, sounds delicious! Good wishes to your Grandma! Wow, 100 years! Those are some good genes! I love frittatas for dinner - so easy and satisfying. Never made a frittata but it sounds good and easy. What a beautiful post about your Nan. She sounds wonderful, as does her frittata. I'm so glad you can whip up this yummy dish and have such wonderful memories come rushing back. This looks super yummy! What a lovely post. I too enjoy frittatas, and your idea of serving it with the english muffin to make a sandwich is inspired indeed. Two wonderful things going on here: your amazing grandmother, and this yummy veggie filled frittata. Thanks for sharing each of them with us. You're so fortunate to have all those wonderful memories of your Nan. 100 years old! wow, bless her heart! This looks so good that I don't even had words to express how divine it looks. Thank you for sharing! Here's to another year of frittatas and a happy birthday to Nan! happy birthday to your nan!!! the fritatta sounds delicious! I'm already looking forward to next year's birthday/frittata post. Happy birthday to your grandmother! How great is that - you grandmother is 100! My grandmother turned 99 last week and when I called her, she was raking leaves! 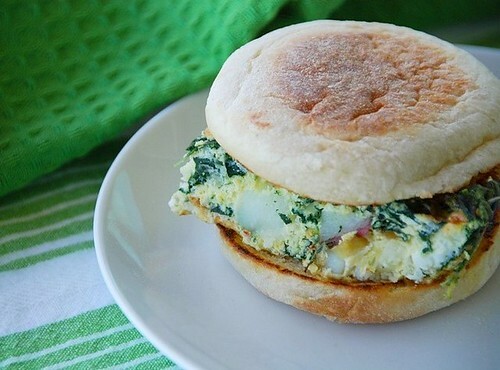 Your frittata looks wonderful - I love swiss chard - and to put it in an English Muffin - brilliant! I so love a good frittata, and it's such a perfect way to use up small amounts of leftover vegetables or herbs but the spouse doesn't eat eggs and can't stand the smell of them so a quick and simple frittata for dinner is out of the question. That makes me sad. This recipe looks so delicious. I've never thought of eating leftover frittata on a sandwich (or muffin). What a great idea! it looks great, but the swiss chard isn't an ingredient. ?? Yum! looks worthy of the really good (expensive) eggs from our CSA for sure. We'll chalk up your grandmothers longevity to preparing and eating delectable dishes like this. Italians do know how to eat!! Aren't grandmother's the best. How wonderful to have her still with you. And fritatas... breakfast, lunch or dinner are a wonderful meal. This reminds me of my grandmother. She was a wonderful cook too, and she could whip up a tasty and satisfying meal for any number of people, with whatever was in the kitchen and not get stressed out about it!! Eggs aren't my favourite but an omelette/ frittata full of vegetables on toast is something I enjoy occasionally. Please pass on my best wishes to your Nan! julie-That is so sweet of you to say. sara-Seriously. Way easier than an omelette. jredneck-whoops. It's in there now. susan-I wrote about asparagus last year. I love it in frittatas. cwannabe-Seriously. I hope my mom and I inherit them! elyse-Thank you for your kind words. lisa-It's a nice change from cereal. louise-Thanks for the lovely comment. treehousechef-Thank you for your visit! nicole-They are good any time of the day. aparna-Why are grandmothers like that? It's amazing, isn't it? i have some smoked gouda and swiss chard. will make this over the weekend. thank you. This looks absolutely perfect, looks like it just walked off a magazine page. Love the ingredients, must be sooo delicious! 100 years old? Wowee! I hope you give her some frittata and it will jog a little memory. Great recipe. All of the things you expect from an Italian grandmother. Congratulations to your grandmother - 100 years! Whenever I come here you always entice me ... I'm going to make a version of this tomorrow for sure! Susan, I hope that your nonna lives many more years. The fritata sounds delicious and this time I have bookmarked it to make it soon. What a lovely post, and such a great memory to have of the times you spent with your mom and Grandmother. I hope to see many more posts like this! Best wishes to your entire family. I'm guessing they are justifiably proud of you! I always make frittatas but they are not so great like your grandmother own! :) I make them usually from with left over potatoes, I slice them and fry them on butter for a while, then I add eggs and rest of the ingredients. Thanks for sharing the Swiss Chard, Potato, and Parmesan Frittata! I can't wait to try it! Hurray on 100 years!! Both of my grandmothers made frittatas too. It is so nice to have these kinds of childhood culinary memories. I warmly invite you to participate in my new Vintage Recipe Thursday. Your Nan's recipes are just the type of recipes that we are trying to preserve to make sure they are not forgotten. grandmother. My nana passed away on 12/23/08 and I miss her terribly, especially since it is Easter. My nana and mother always made our frittata with ricotta, provolone,basket cheese, ham, pepperoni and sometimes green pepper. We bake the frittata on a baking sheet and cut in squares. When I was little my mom always made the frittata on Good Friday and we would wait till after midnite to run to the kitchen to eat a piece.